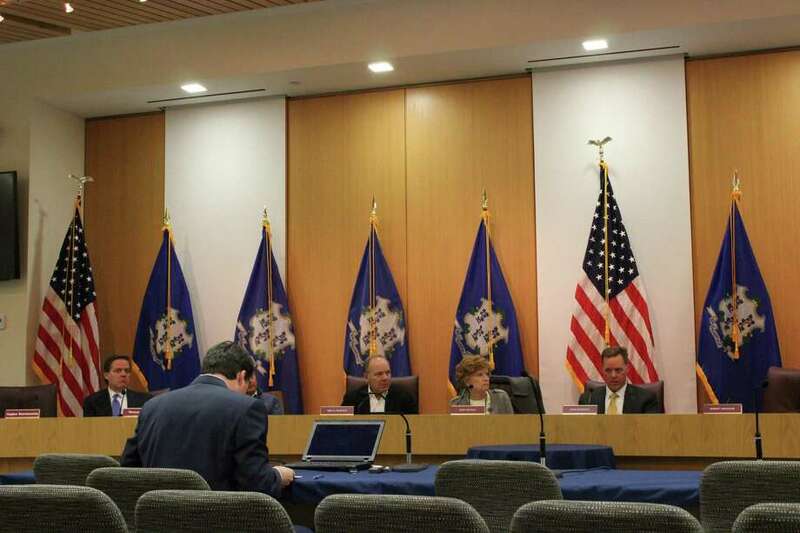 Board of Finance meeting on Tuesday, Nov. 14 at the New Canaan Town Hall in New Canaan, CT.
NEW CANAAN — Though originally slated to be completed this summer, officials believe the extensive high school field project won’t be finished until summer 2018. After suffering budget overruns, the estimated $5.8 million project funded by the town and the New Canaan Athletic Foundation was given an additional $800,000 by the the town council in late September. In a presentation to the Board of Finance Tuesday, board member and NCAF representative Robert Spangler said the project is expected to be completed in its entirety by summer of 2018 although the track and turf fields will be “operational” by Dec. 15. The track will be available for use on Dec. 15 though it won’t have the final performance surface, a Benson 300 system according to a project update by the Town Fields Building Committee, placed until next summer. Spangler said the Benson 50 system is used by many high schools around the country, it’s perfectly good, the issue is that it will wear out after five or six years. “The higher grade performance surface will not be placed until next summer,” he said speaking of the Benson 300. However, unforeseen costs relating to the gradation of the first Water Tower Turf Field have caused those numbers to rise to where they are now.